Is your outfit big night-ready? 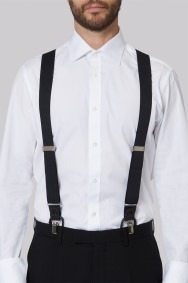 These practical and stylish braces from Moss 1851 can help set off your look whatever the occasion. Versatile and functional, the clever two-in-one approach lets you bring a slim-fit silhouette to any suit. Plus, they frame your shirt beautifully while adding snap to your style. All of which means you'll be best-placed to throw shapes on the dance-floor without worrying about wardrobe malfunctions. Fully met my requirement,courteous staff. Good quality braces. One problem they are sold as 2 in 1. 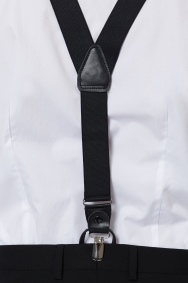 Button and clip trouser attachment. However buttons not supplied. Others I had in the past supply buttons. Bit of a hassle tracking down buttons to suit. nice to have the clips as an option - it still looks a bit cheap. But they work. 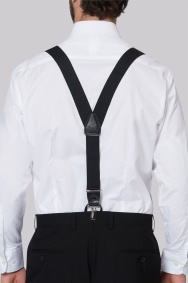 The braces were bought to be used with tux hired from Moss Bros.Tux hired did not have buttons for the braces and because of order issues tux was completely unwearable. 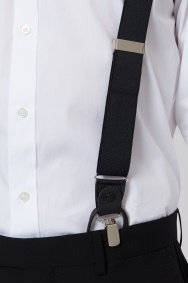 Braces worked well for other pants that we brought with us and we are happy with the braces. The tux hire issue is a totally different story.